One of our team photos in this screenshot. A pseudo-plugin header with a few of our WordPress usernames. See a presentation in action! 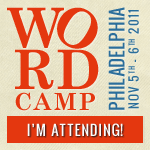 I’m Attending WordCamp Philly 2011!